Chelsea Green Publishing Company, 9781603580595, 215pp. 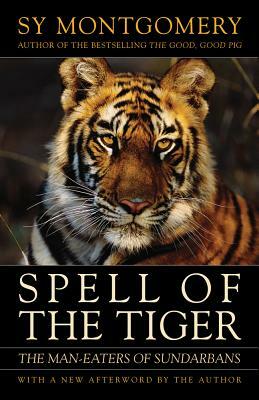 From the author of The Soul of an Octopus and bestselling memoir The Good Good Pig, a book that earned Sy Montgomery her status as one of the most celebrated wildlife writers of our time, Spell of the Tiger brings readers to the Sundarbans, a vast tangle of mangrove swamp and tidal delta that lies between India and Bangladesh. It is the only spot on earth where tigers routinely eat people--swimming silently behind small boats at night to drag away fishermen, snatching honey collectors and woodcutters from the forest. But, unlike in other parts of Asia where tigers are rapidly being hunted to extinction, tigers in the Sundarbans are revered. With the skill of a naturalist and the spirit of a mystic, Montgomery reveals the delicate balance of Sundarbans life, explores the mix of worship and fear that offers tigers unique protection there, and unlocks some surprising answers about why people at risk of becoming prey might consider their predator a god.